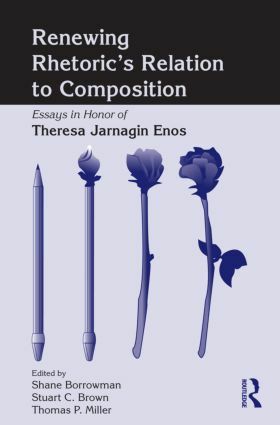 Renewing Rhetoric’s Relation to Composition comprehensively examines the development of rhetoric and composition, using the writings of Theresa Jarnagin Enos as points of departure for studies of broader trends. Chapters explore such topics as the historical relations of rhetoric and composition, their evolution within programs of study, and Enos’s research on gender. The volume presents the growing disjunction between rhetoric and composition and paints a compelling picture of the current state of both disciplines as well as their origins. This volume acknowledges the influential role that Theresa Enos has had in the writing and rhetoric disciplines. Her career provides benchmarks for plotting developments in rhetoric and composition, including the evolving relations between the two. This collection offers a tribute to her work and to the new directions in the discipline stemming from her research. With an all-star line-up of contributors, it also represents the state of the art in rhetoric and composition scholarship, and it will serve current and future scholars in both disciplines.